For my final university project, I decided to really jump into my interest in ink work and darker styles of art. 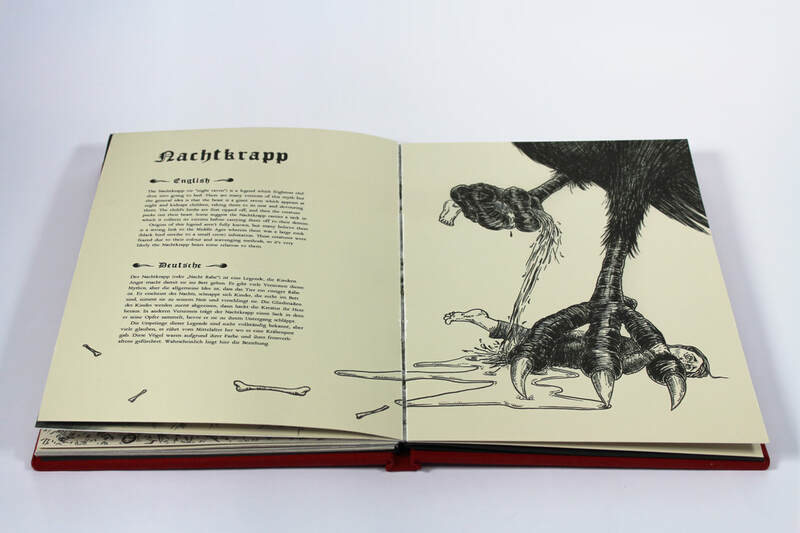 My father is German, so I was brought up around quite a lot of disturbing childhood stories and fairytales - common to the German culture but horrifying to Brits, including my mother. 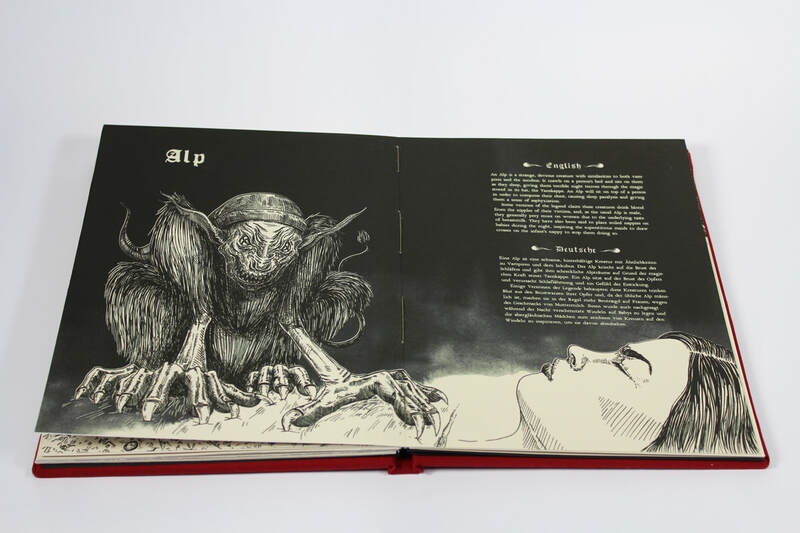 I looked into German mythology and created a handmade book of selected legends, described both in English and German. All of these drawings were created using ink and dip pen which I then scanned into a digital file in order to add text. The aged paper effect was achieved by simply placing a coloured layer across the print and dotting a few patches of grit effect on top. This book was hand-bound using linen thread and a lot of frustration. As the pages were printed onto Fabriano, there was a lot of pressure on me not making any mistakes. However, I did end up tearing a page and having to pause the stitching process to print off another two spreads. 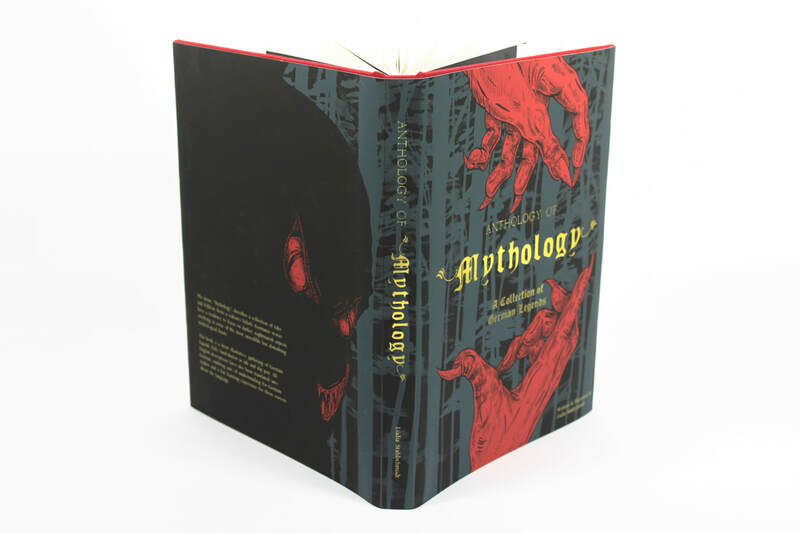 The main cover is made of screenprinted red cotton wrapped around rectangles of card and foamboard. My original design did not feature a dust cover but I was toying with the idea for a while and ended up adding it for my own curiosity. 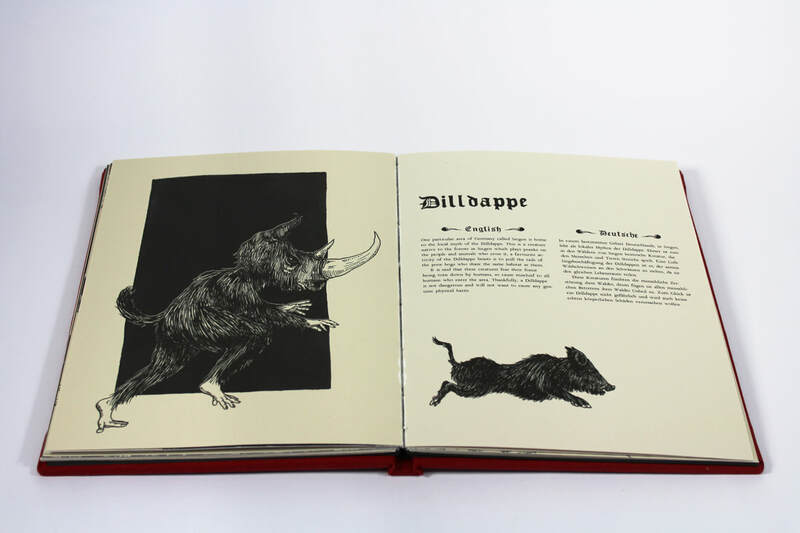 A friend of mine studying photography, Meg Ogley, kindly took some atmospheric photos of my book which really added to the creepy "feel" I was aiming for. 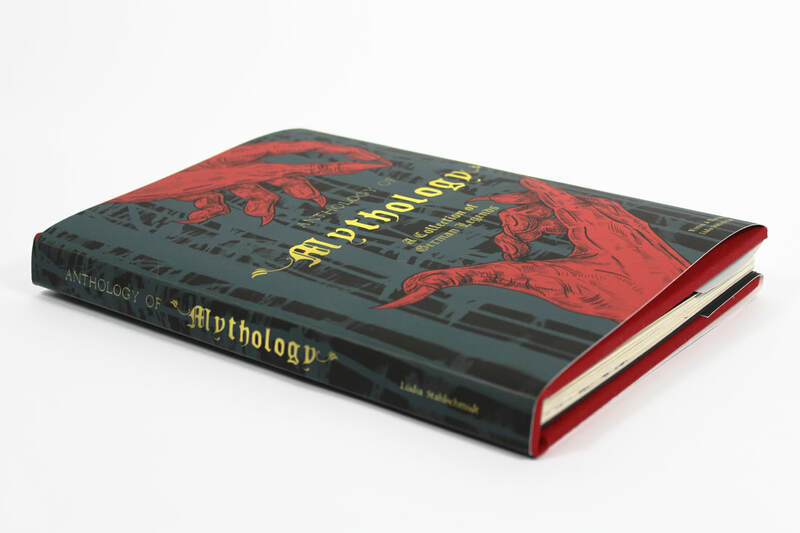 The screenprinted cover had a much more ancient aesthetic than the dust cover so I decided to keep the book bare in the photo shoot. You may be confused by the last photo. 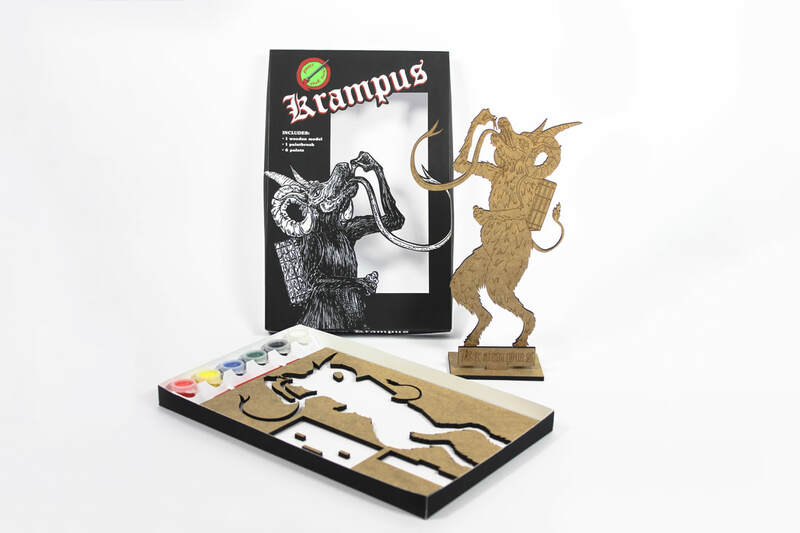 Along with with book, I also screenprinted a T-shirt featuring my Aufhocker design and created a "Paint Your Own Krampus" kit for children, featuring a small set of paints and a laser-cut 2D wooden Krampus model. 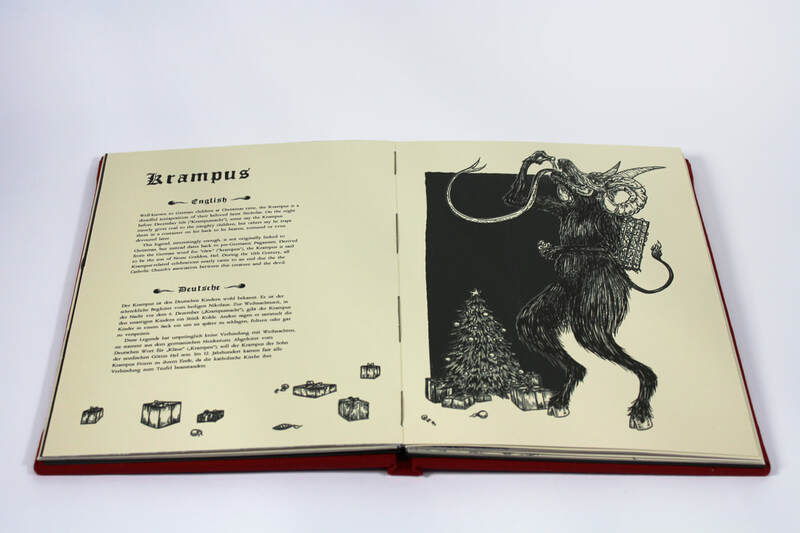 This project turned out so much better than I had anticipated and I even managed to successfully fund a Kickstarter to have my book professionally printed, raising over £3000 with 151 backers. I hope you enjoyed looking through my work as much as I enjoyed creating it.